Of course, you know I’m gonna blog this. Yes, I work at LinkedIn and I’m stoked to see the really hard work many of my colleagues come to fruition. Delivering near flawless availability (99.97 percent), LinkedIn soared to the top of the rankings after grabbing the #4 spot in the second quarter. While more than 19,000 measurements were recorded during Q3, only six errors were noted. 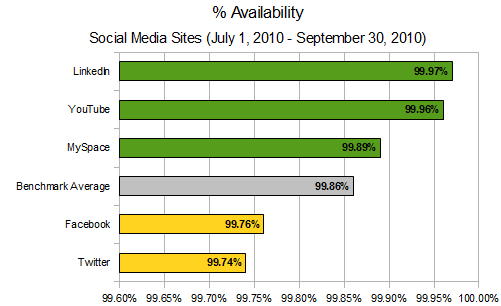 YouTube came in second, with 99.96 percent availability. 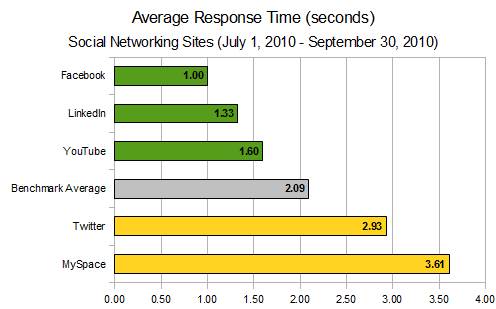 … and looks we came in a close 2nd to Facebook in site response time as well. Impressive! For the second consecutive quarter, Facebook has proven itself to be the fastest social network, shaving 0.02 seconds off its Q2 average response time to bring its number down to 1 second flat — its lowest quarterly response time recorded this year. YouTube, too, experienced its quickest response times to date in Q3 at 1.60 seconds. I think this is pretty critical, especially since sites like LinkedIn are becoming essential productivity tools and being up and running could help you, the user, get your job done better and faster. Alright, that’s about it. Now back to regular programming on this blog. Stay tuned. Welcome to Toronto Mario! Toronto is my home and native land. You still around here. We should meet up. Sounds exciting, Mario. I love Toronto and the cottage country! Best wishes with your move. Hope to see you again in Austin in March. Sounds exciting, Mario. I love Toronto and the cottage country. Best wishes on the move. Hope to see you again in Austin in March. Sorry I missed you Mario. I was in Toronto last week to see family. If you’re even in Nashville please let me know. I hope to be back in T.O. early 2011. Tht sure looks good. Thanks for the recommendation! And, please let me know when you’re back in town.